Google has announced Nexus Q which is Google’s first consumer electronics product. It is a small, sphere device that works with an Android device to stream media from the cloud. It can pull content from your YouTube and the Google Play music app and more. 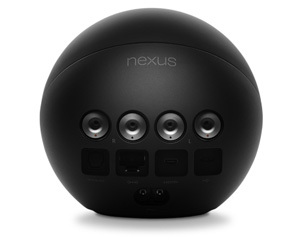 If you own an Android device then you will be able control the Nexus Q to play content from your library. It can also be used as an amplifier as it lets users plug in external speakers to receive power from it’s 25-watt amp. Cool! The little sphere device runs on a OMAP 4460 processor with 16GB of storage and 1GB of RAM dual-band Wi-Fi, Ethernet, Bluetooth and NFC for tapping a device to the Q to exchange software and media. Nexus Q will be available for $299 in mid-July and Google will also sell a set of $399 Triad bookshelf speakers to go with the device.